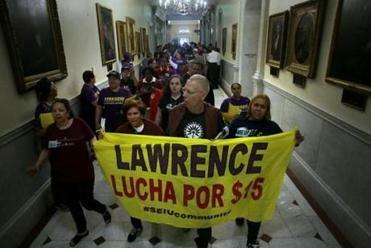 The Raise Up Massachusetts coalition rallied at the State House in May. Advocates said Tuesday they are conditionally dropping their pursuit of a ballot question that would have mandated a $15 minimum wage by 2022 and ensured tipped workers make more than was outlined in the compromise proposal passed by state lawmakers last week. The decision by Raise Up Massachusetts — a coalition of labor, faith, and community groups — hinges on Governor Charlie Baker signing the bill. But if he does, it will ensure that all three initiative petitions lawmakers hoped to keep off the ballot with the so-called grand bargain legislation will not go to voters in November. “We’ve won the Fight for $15, and we’ve won the fight to ensure that workers can take job-protected paid time off from work to take care of themselves or a family member after a medical emergency or the birth or adoption of a new child,” the Raise Up coalition said in statement. The bill, which Baker has until July 1 to act on, represents a compromise between advocates and the business community, and would raise the minimum wage to $15 by 2023, ensure paid medical and family leave, and eliminate premium pay for workers on Sundays and holidays. 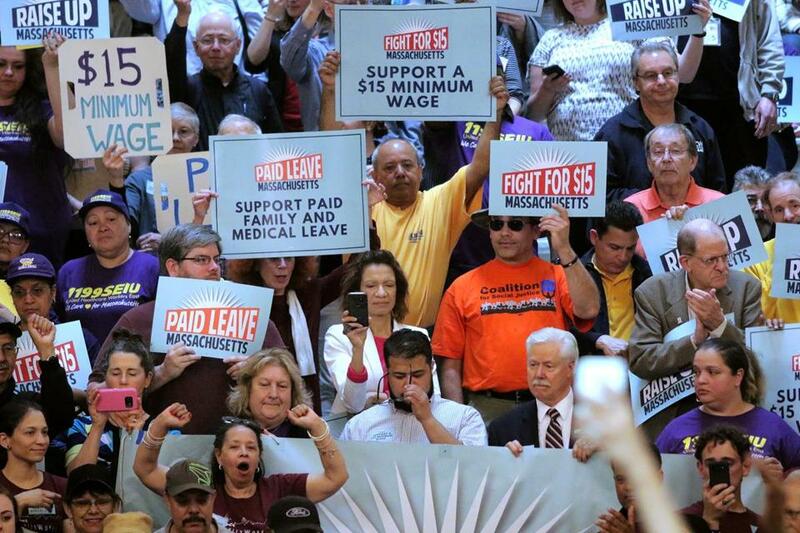 The legislation would make Massachusetts the third state in the country to approve such a wage floor and institute paid family and medical leave, the Globe has reported. With speed rarely seen in the State House, the Mass. House took a preliminary vote on a bill that is aimed at avoiding a bitter electoral showdown over three ballot questions this November. The left-leaning Massachusetts Budget and Policy Center said increasing the minimum wage to $15 by 2023 would raise the wages of about 840,000 workers. Baker has said he is reviewing the bill, which also includes a new $800 million payroll tax to fund the paid leave program. The bill was an attempt to stave off three separate petitions that would slice the sales tax from 6.25 percent to 5 percent, establish a similar paid leave mandate, and hike the minimum wage. After the Legislature passed it, a business group pushing the sales tax question said it would abandon its pursuit if Baker signed the measure, which includes a sales tax holiday. And Raise Up Massachusetts also quickly said it would no longer push its paid leave petition. But it was far less committal on the minimum wage front, given its ballot question would establish the $15 wage floor sooner and ensure tipped workers get a higher minimum cash wage than the $6.75 per hour they’d eventually be guaranteed under the legislation. Some factions of the group were also stung by lawmakers’ decision to eliminate time-and-half pay on Sundays and holidays as part of the legislation, adding to the unease among its 100-plus members. Petitioners have until July 3 to file their final set of signatures to put the measure on the ballot. The decision adds to the shifting landscape of the November ballot. Earlier this month, the Supreme Judicial Court rejected a ballot question that would have raised the state income tax on Massachusetts’ highest earners and put that money into transportation and education, siding with business groups that argued the proposal was unconstitutional. Only one referendum so far is guaranteed to go before voters: whether to repeal the state’s antidiscrimination law on transgender rights. Polls show it was shaping up to be the most competitive question on the ballot. But there are others that could still make it. The court earlier this month cleared the way for voters to express their views on nurse staffing levels in Massachusetts hospitals, ruling in favor of a ballot petition backed by the Massachusetts Nurses Association.